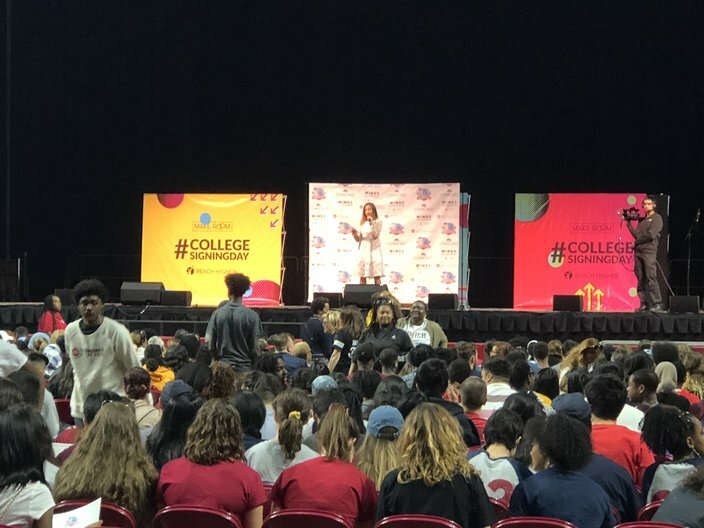 Former first lady Michelle Obama speaks to thousands of Philadelphia high school seniors during annual College Signing Day festivities on Wednesday afternoon at the Liacouras Center at Temple University. "We expect great things from you," she told them. 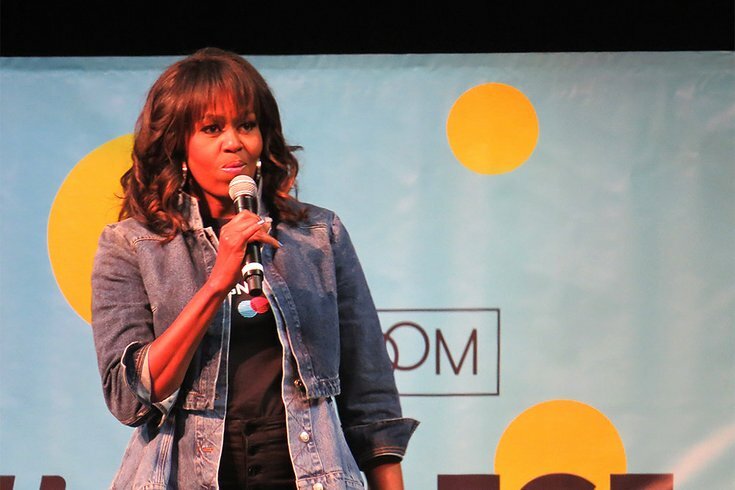 Former first lady Michelle Obama told thousands of Philadelphia high school seniors on Wednesday that their future success is necessary for the country. But she said it is "perfectly normal" for them to feel anxious as they take their next steps, recalling the doubts she faced as she entered Princeton University. Some 8,000 students filled the Liacouras Center to celebrate the next step toward their careers. Obama's speech capped a celebrity-filled event that included live music, dance performances and brief speeches. The event marked the fifth straight year that Obama celebrated College Signing Day, a nationwide event that honors students heading off to professional training programs, college or universities, or the military. The event mimics National Signing Day – the day when the country's top high school football recruits formally announce where they'll attend college. Across the country, some 2,000 college signing events were being held. That Obama chose to celebrate in Philadelphia thrilled the students, who erupted into loud cheers as she took the stage. "It makes me even happier to go to college," said Cameren Sullivan, a CAPA senior who is headed to University of the Arts. "Every time I cheered for Michelle Obama, I got goosebumps." Obama told the students how she was scared to leave the south side of Chicago to attend Princeton University in the early 1980s. The Ivy League school stood in contrast to her urban upbringing. But she stressed that being fearful of the next step is normal. And she urged them to ignore the doubters. No matter where you go, she said, some people will always doubt you. "Shoot, when Barack and I set foot in the White House, it was a struggle," Obama said. "There were a lot of people who told us that we weren't supposed to be in the White House, that we couldn't handle the pressure, that we weren't ready. "So I'm telling you, they will doubt you today and they will doubt you for the rest of your life." Her message resonated with the students, many of whom wore t-shirts from the colleges they will be attending. "A lot of people here could relate to that in Philadelphia," said Funke Alliyu, a Central High School senior who will attend Penn State University next fall. Her classmate, Najah Siddiq, echoed those thoughts. And due to their close seats, Siddiq briefly got to hold Obama's hand. "It was amazing," said Siddiq, who will attend Temple University. "I wanted to talk to her, but there was too many people." Obama urged the students to find supportive instructors, seek out tutors when necessary and join study groups and clubs. Every students struggles at some point, she said. "Don't be too proud to get the help you need," Obama said. "And know that you are never struggling alone. Everyone who shows up at college – I don't care how much money they have – they're concerned. They're worried. "So, you are not alone. And just remember, you have this community right here in your hometown that is rooting for you every step of the way." Philadelphia high school students file into the Liacouras Center before Michelle Obama's appearance at College Signing Day. After concluding her remarks, Obama stayed on stage, dancing with a handful of students and snapping selfies. Tamir Harper, 18, a senior at Science Leadership Academy, was among a small group of students that greeted Obama before she went on stage. He shared his excitement with reporters before the event. "I'm first going to stop for a minute and acknowledge that she's in front of me," said Harper, who will study political science and secondary education at American University in Washington. "I want to first get some advice from her, because she's made it." Obama previously celebrated College Signing Day in New York City in 2016 and 2017. Before that, she traveled to Detroit and San Antonio to participate. Harper was excited to hear she was coming to Philly. "It tells us that urban students are not forgotten about," Harper said. "It's absolutely amazing. It tells us that we can continue to move forward." But Obama was far from the only notable name to address the students. Actor Robert De Niro jokingly asked the crowd whether anyone was attending Trump University before stressing they have the power to bring real change. "As you go forward to higher education, you have the opportunity to change the world, to make it better," De Niro said. "Soon you will be voting for the first time. That's a great way to start." "Don't flunk now," he added. "We are depending on you. You are the future." De Niro gave way to Jenkintown native Bradley Cooper, who echoed those remarks. "You are the future," the actor said. "We are counting on you. We are depending on you. And I like the way you look." De Niro and Cooper were just a few of the big names that appeared at the Liacouras Center. Singer Camila Cabello brought the crowd to its feet with a performance of her No. 1 hit "Havana." Singer Kelly Rowland said she wants to be "saying every last one of your names" in the years to come. And actress Rebel Wilson stressed that education opens up many doors. "If you have a good education, you have so many options in life," Wilson said. "Congratulations to everyone here. You will have these options, too." Model Karlie Kloss, performing artist Ciara, singer Zendaya and Philadelphia's own Questlove all appeared, too. 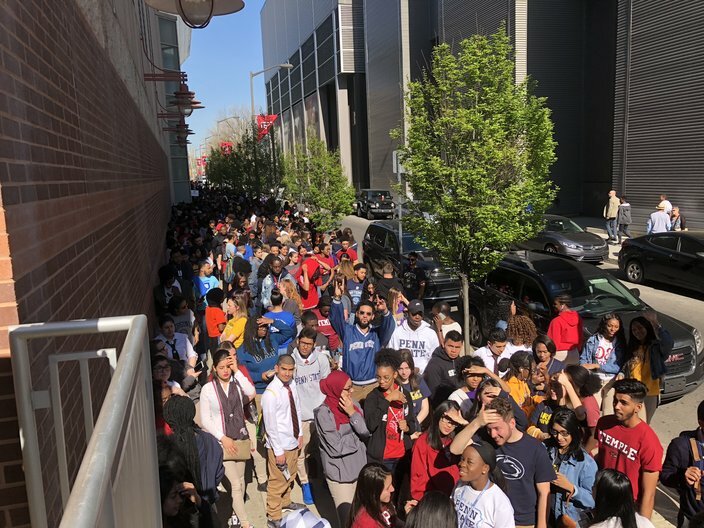 Thousands of high school students wait to enter the Liacouras Center for College Signing Day on Wednesday, May 2, 2018. Former first lady Michelle Obama will deliver the keynote speech to some 8,000 high school seniors. Seeing so many celebrities left many of the students in awe that they would step away from their busy lives to celebrate with them at College Signing Day. "I feel amazed," said Shanewaz Chowdhury, a Masterman High student who will attend Drexel University. "These are people from all over the world. They came here to support us in our career paths." Several athletes also appeared, including former 76er Dikembe Mutombo, former St. Joseph's hoops standout Jameer Nelson, and Eagles safety Malcolm Jenkins. So did Villanova coach Jay Wright, fresh off his second NCAA championship. "We're all proud of you and we wish you the best," Wright told the crowd. "Keep a great attitude. Stay humble and hungry." The event was hosted by Reach Higher's "Better Make Room" campaign. Reach Higher is an initiative Obama created five years ago to inspire students to take control of their future. That's the message that Michael Davis will take with him to Duquesne University next fall. "The sky is the limit," Davis said. "Don't let anyone bring you down. You're in charge of your own future, not anyone else." While Obama's visit thrilled the thousands of students who came out, it proved a fitting end to Davis and his classmates' time at Masterman. Eight years ago, they were fifth-grade students when another notable guest addressed them. That speaker? President Barack Obama.